At HB Digital we specialise in the design, supply, installation and repair of a full range of MATV, SMATV, and full IRS aerial & satellite systems. We have installed many of these systems in hotels, guest houses, holiday homes, caravan & lodge parks and apartment buildings throughout Gwynedd, Anglesey, Conwy, North Wales and the North West. A full 5 wire IRS system for over 300 bases spread over a 60 acre site. A SMATV system using the latest digital multiplexers to incorporate SKY sports channels into digital Freeview tuners. A large SMATV system to over 200 rooms. We also specialise in the repair, upgrade and maintenance of all commercial aerial / satellite systems. 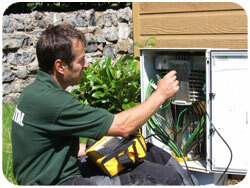 In summary we can tailor a system to suit your needs whether you are a 5 room guest house or a 500 base caravan park. Our professional commercial satellite installers cover all of Bangor, Gwynedd, Anglesey, North Wales and the North West.